MONTREAL, QC – Microbrasserie 4 Origines has announced details of its first Hallowe’en themed beer, as well as a series of events to celebrate the release and the holiday. 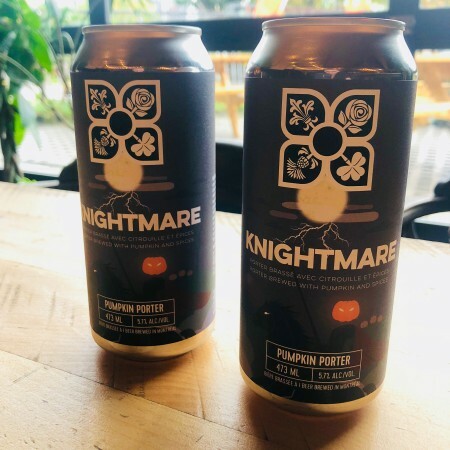 Knightmare (5.7% abv) is a robust porter brewed with pumpkin and spices that will be launched at the brewery on Saturday October 20th, where it will be available on tap and in 473 ml cans. Following the beer launch, many evenings at the brewery leading up to Hallowe’en will feature special PumpkinFest events including scary trivia nights (October 22nd & 29th), cask night (October 25th), Peach Fuzz IPA release (October 26th), and costume party (October 27th), culminating with a Hallowe’en comedy night on October 31st. Beer specials and sales on merchandise will also be offered throughout the run. For more details, see the PumpkinFest event listing on Facebook.